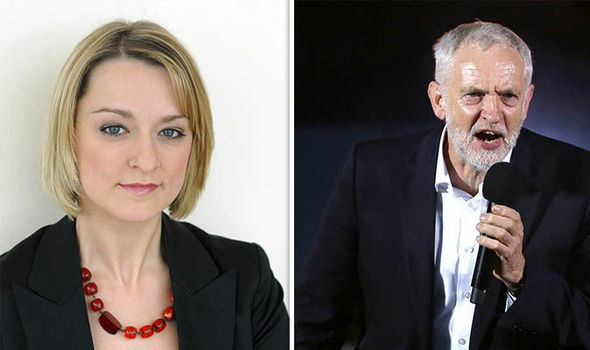 THE BBC has hired a team of bodyguards to protect politics editor Laura Kuenssberg from vile left-wing trolls at the Labour Party conference, it is claimed. Ms Kuenssberg has suffered a tirade of hate and even threats of violence on social media from supporters of Jeremy Corbyn. They accuse the journalist of bias against the Labour leader, particularly during the General Election. And with Mr Corbyn’s popularity surging after his better than expected showing at the ballot box, concerns for the 40-year-old’s safety have increased. A source at the corporation told The Sun: “Laura is a well-known public figure. It is at least the second time the corporation has needed to draft in extra security to keep the high-profile reporter safe. During the summer’s election, the BBC reportedly funded a team to look after her during public events. An online petition was even setup calling for the BBC political editor to be fired from her role at the broadcaster gathered 35,000 signatures. It was taken down by executives at 38 Degrees, the website that hosted the poll, over claims it had been “hijacked, and used as a focal point for sexist and hateful abuse”. During the EU referendum, she was hissed by a crowd when she asked Mr Corbyn about workers’ rights. Deputy leader Tom Watson said he was “embarrassed” by their behaviour. Labour MP Yvette Cooper is also among those who has slammed her party’s supporters for their behaviour. She said: “Frankly I am sick to death of the vitriol poured out from all sides towards Laura Kuenssberg. Earlier this month, BBC chairman Sir David Clementi also slammed the treatment of journalists like Ms Kuenssberg, accusing her abusers of misogyny. He said: “I have become increasingly aware of the abuse that some of them – particularly female journalists – are subject to, on an almost daily basis. “It also occurs in plain sight, at press conferences and political gatherings on all sides.